Baruch attah adonai elohenu melech ha-olam. Blessed are you Lord our God, ruler of all possibilities. And Rachel wept, wailed, lamented for her children. I don’t know, guys. I mean, it was Christmas just last week. and it wasn’t as clean and pretty as we like to remember it. But, good God, it’s so much worse this week. I don’t really want to preach about this story. were living in Bethlehem and things were ok.
like they knew something was up. So they grabbed what they could and ran. I imagine they weren’t the only ones. there were families choking the road trying to get away. maybe trying to be strong for the kids. And what were they running away from? and make himself feel immortal. and murdered in the street. but also creating a ready-made misery when he died. but the destruction of the beauty and potential of young lives. It’s called the Slaughter of the Innocents. I’m not ready for this, liturgically or emotionally. Scholars say this didn’t actually happen. so it might only have been 20 children. As though that makes it better. Twenty or ten or even five means it’s not horrific. But most scholars say this is a theological point, not an historical one. Herod never had these babies killed. either in the bible or in historical sources. He wrote it in himself to make a theological point. at the beginning of the gospel of Matthew? That’s him tying Jesus definitively in to the family of David. Remember the star that the magi followed? Related to some passages in the book of Numbers. The holy family runs off to Egypt? And warnings in dreams? like Moses did but better. to the story he’s telling about Jesus. And it works for him in general. But…but. We don’t need this story to be factual for that historical time and place. We don’t need it to have actually happened to tell the story. We tell the story because we know the story. It happens over and over and we don’t know how to stop it. for the praise team to offer the song “Christmas Eve Sarajevo” by TSO. I wondered why it was called that. ethnic cleansing between the Serbs and Croats in the former Yugoslavia. and so many other conflicts. For three years they killed each other, both military and civilian. Families and entire towns were annihilated. The city Sarajevo took the worst of the damage. and played Christmas carols through the night for days. The TSO song he inspired is beautiful but it is heartbreaking. and so many of those massacred were innocent. This story repeats throughout history. to take back the Holy Land from the infidels. one of them was called the Children’s Crusade. the long, violent journey to Israel. They didn’t make it. At all. for the rulers, for the adults. from whom we’d taken the land needed to be more white. You think I’m kidding or using modern understandings of racism. and made them ready for polite society. Where they wouldn’t be accepted anyway. How many of them died of suicide or broken hearts? I’m not being poetic here. This was a different kind of massacre. He wasn’t King Herod trying to keep power. He wasn’t trying to reclaim the Holy Land with sacrificial victims. Yet the result was the same. Innocents sacrificed for an adult’s dream. as scientists show us how damaging it is. for the adults to prove their righteousness. the length of time Flint, Michigan has gone without drinkable water. are the slaughter of the innocents over and over. Maybe we do know how to stop it, but we don’t. It’s too hard. and that we don’t want to stop, not really. Jesus the cute baby comes into this world, this sinful, R-rated world. he walks with us and experiences pain just as we do. to juxtapose sweet Christmas with horrible slaughter. It’s hard but good to hold these different experiences together. If God is God, then God should do something. here on New Year’s weekend? how there’s hope, how Jesus changed things. 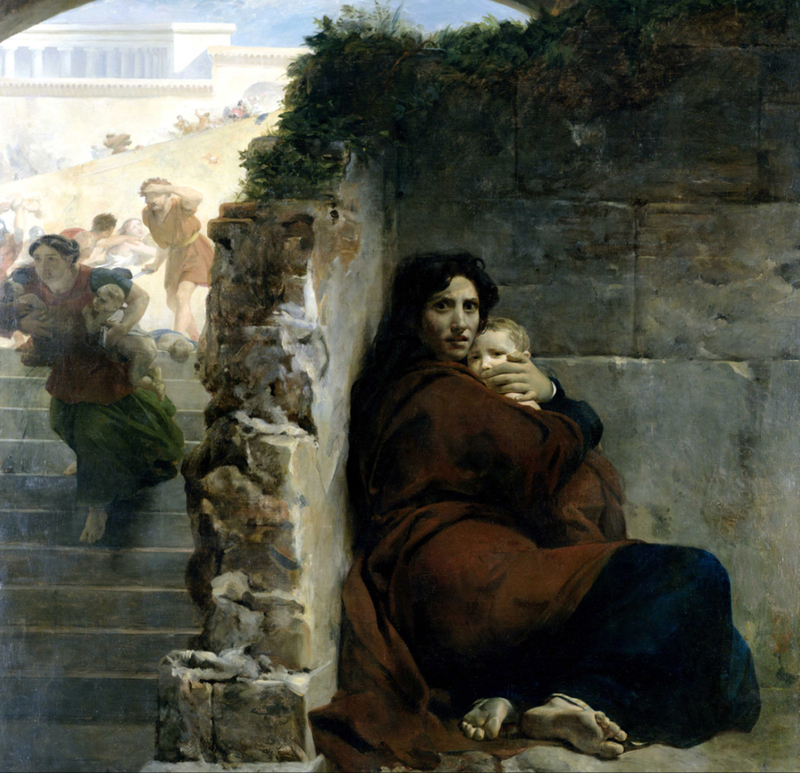 Where is the good news in the slaughter of the innocents? All good questions, but all predicated on a rather small God. God who is entangled by our rules and our physics. God who is entangled in our expectations of rightness and judgment. and as tender and caring as nothing we’ve ever experienced. weaving the fabric of the universe together. Time’s Arrow by Martin Amis. unless it’s lived backwards. Do you get that? during World War II as it is. the massacre of the Holocaust would be beautiful. but he also says Jesus is not exempt from horror. someday it will be gone, next year in Jerusalem, in the Kingdom. and there will be neither sorrowing nor sighing. without falling into infinite despair? we simply see it, clearly and without argument. possibility for God to do that new thing.